Double pressures – Genetics research and romance in a lab (Manhattan, contemporary times): Plenty of fiction evokes a strong sense of time and place, but we don’t often come across fiction strongly-scented about our sense of smell. Andrea Rothman is perfect for dreaming up a story about genetics researchers seeking the genes responsible for olfaction because she once was one. Richman’s debut novel is as fresh and smart as the cutting-edge research going on at a genetics lab where she used to work (The Rockefeller University). Her invented lab – American University of Science Research (AUSR) – and the real one are located along Manhattan’s East River, where the city is developing a major Life Sciences Corridor. The author was a postdoctoral fellow researching the “oddball” set of genes responsible for our sense of smell – the scientific plot of The DNA of You and Me. 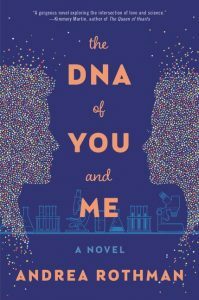 There’s some other DNA also strongly-flavoring the prose involving the chemistry of romance between two geneticists – Emily and Aeden. For a novel with a scientific theme, fiction readers need a writer who can disarm non-scientists to make the science accessible. We also need a hook we can all relate to by a writer who can charm us with an engaging plot and pleasing prose. Richman proves she has a literary knack for doing both, translating technical science into layman’s terms ever so gently while entangling it with provocative prose on contemporary issues. Taken together, the novel achieves a double effect: gaining a better appreciation of the importance of a sense we may take for granted, and stirring us to think about what matters most to us in life in terms of our goals, values, and ethical principles. 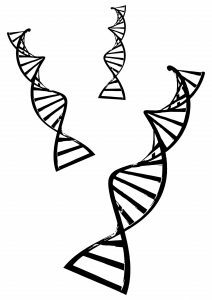 The double helix is a term that refers to the shape of DNA, defined as two strands likened to twisted ladders or staircases. The novel is about the tension between two strands – professional versus personal – both of which twist and turn. This twisting is seen in the sketches of DNA twisted ladders that introduce the novel’s five parts. This image doesn’t do justice to the complexity of what’s involved in identifying “how the olfactory nerves, hundreds of thousands possessing different odorant receptor types, ultimately reached their targets, allowing us to smell.” The plot and characters center around trying to figure out how that complicated genetics and neuroscience works. Justin’s judgment of Emily was spot-on. It drives the plot and the serious questions raised. Can a woman like Emily, with her set-in-stone career aspirations and asocial personality (“human company is overrated”) ever be happy with anyone? Is she fated to be alone? What if someone comes along and could be the right person for her, would she be willing to compromise her single-minded professional dedication? How deeply conflicted and risky would that decision be, when Emily cannot even “figure out how to be happy”? Friendless all her life, she really doesn’t know “there’s a purpose to being around other people.” Richman has created a character as odd as the mysterious genes. Enter Aeden, a postdoctoral fellow Emily meets on day one of her new job, the same day she’s landed in New York. “Men rarely noticed me,” she says, though her fiery red hair would seem to negate that perception. In fact, Aeden does notice her but for the wrong reason. Aiden begrudges her because he (and lab partner Allegra) have been working for three years on a project similar to the one Justin hired her for. They knew this but Justin never told Emily. Was this ethical, pitting colleagues against each other? Emily tells Justin if he’d told her she never would have accepted the job. Emily knows something about the fierce competition in science labs. In weighing this ethical question (in a novel that evokes many), we need to factor in that Aeden and Allegra are using traditional lab techniques while Emily is using computers to analyze genetics, a field known as bioinformatics. Justin still should have told her, don’t you think? But all Justin cares about is the race to the top. Emily and Aeden get off to a very bad start and stay entrenched for a long time. Between Emily’s anti-social personality, Aeden’s resentfulness, and their mutual intensity they’re an unlikely pair. Theirs is a slow-to-develop, difficult relationship analogous to the slow pace of complex science research. The novel, though, moves easily, briskly. Science tells us something about human beings so look for double meanings. Start with the novel’s cleverly titled five parts: Part 1, The Wrong Genes, cluing us in on failed research and mismatched colleagues. Part II, A Bridge, applies to DNA structure as well as finding a bridge to allow any relationship to foster between the two central characters. Part III, Recombination, is a genetics term and a way to describe the changing nature of Emily’s and Aeden’s relationship. Part IV, Chimera, also from genetics, describes Emily’s romantic crossroads. Fantasy or not? Emily spent her childhood indoors due to an allergy to the smell of grass, shutting herself off from people, setting a lonely pattern for her future. Her interest in olfactory research was inspired by an allergic condition, but it was also influenced by her father’s work in a chemistry lab. Actually, there’s a more profound origin for Emily’s solitary preferences despite her saying “for no apparent reason, I didn’t like people very much, and did not care to be around them.” Abandoned by her mother when she was a baby, it’s no wonder she doesn’t trust people and has only been attached to the father who raised her on his own. When the novel opens, he’s already passed away. No wonder too that Emily finds comfort in an hermetically sealed profession, enabling and rewarding her for cutting herself off from the outside world. Occasionally, she steps out and into it. When she does, nature fills the prose, giving Emily and us a jolt as to what it might feel like cooped up in a lab for crazy long hours, day and/or night. Experiments are timed; ambition has no time limits. The prose also exudes smells, as Emily is hypersensitive to them. Examples include the “buttery odor” of shampoo, “nicotine on his breath,” the “sea-breeze odor of his T-shirt,” the “rotting fish” odor of a “neuron-staining solution,” and the “mild stench” of the East River. All make the point that smells are tied to memories, good and bad. Emily is 40 when Chapter 1 opens, looking back on 12 years earlier when she worked in Justin’s lab. So while we think we know the ending told in the early pages – she receives the prestigious Lasker award for her “contribution to neuroscience” – as we get into her backstory we realize we have no idea until the end whether she and Aeden reach the target of coming together, mirroring the quest to reaching the targets to explain how we smell. Emily is an unusual woman whose scent will linger. And deceptive too. Breezy read while being thought-provoking. Thanks, Pat, hope you enjoy.